A masterpiece of suspense from Tom Kakonis, author of Treasure Coast and Blind Spot. FLAWLESS. That’s how women describe Michael Woodrow. He’s an irresistibly handsome corporate hatchet man, trimming costs by axing employees. He also likes to kill women. FLAWLESS. That’s how he balances his professional and homicidal lives until he falls in love with his next-door neighbor… and his father is released from prison after serving 18 years for murdering Michael’s mother. FLAWLESS. That’s a standard that becomes increasingly difficult for Michael to sustain when a sleazy, but sharp Florida PI closes in. 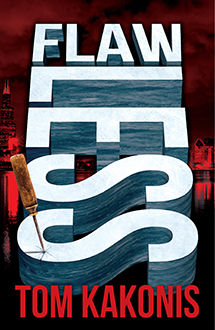 Flawless is an intense thriller... chock full of interesting and devious characters.